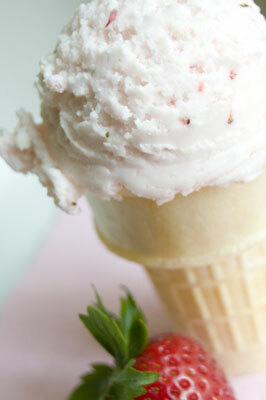 Working with ice cream in food styling and food photography can be quite a challenge. The advice here also applies to any similar frozen treat, like sorbets, frozen yogurts, and gelato. Working quickly with these desserts is key, and some photographers choose to use substitutes instead. Buy the right tool: Invest in a good ice cream scoop. The top of the line can be had for just under $20. The scoop should have a handle release to scrape the ice cream out cleanly. Before scooping, dip the scoop in absolutely clean water; lukewarm is best. Consider your lighting: When working with the tricky frozen desserts, use natural or strobe lighting rather than hot continuous lights. Extend your shooting time: After removing the ice cream from the freezer, keep it on ice. Try placing the dish of ice cream on a bed of ice covered with a thin surface, such as a cloth or napkin. Another way to extend shooting time is to shoot a full container of chilled ice cream, or even gelato, as shown in the following figure. The sheer volume of the tray of gelato (about 5 pounds) self-chills and allows the top to stay frozen a bit longer while you shoot. 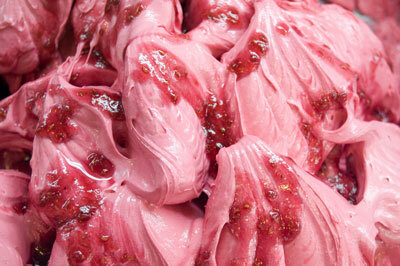 A tray of glossy gelato helps extend shooting time. Set up everything else first: Lay out your set, your backgrounds, your props, your accents, your lighting — the whole shebang. Take test shots with an empty cup or bowl. You can also use a wadded-up paper towel or napkin to act as a stand-in while you check your shot. Super-chill the ice cream: Turn the temperature down in the freezer to achieve maximum frostiness. If possible, use a full fat ice cream, as shown in the following figure. Full fat is a much hardier ice cream that melts significantly slower. Work fast: Now that you’re ready to shoot, the key here is speed. You need to work quickly to get the images you need from the ice cream before the inevitable melting starts. 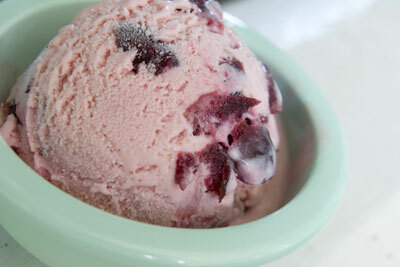 A fresh scoop of homemade cherry ice cream. To overcome the time constraints when shooting ice cream, some photographers use an ice cream substitute made of various concoctions. Some photographers use mixtures that are playdough-based, mashed potato-based, powdered sugar-based, frosting-based, and so on; a lot of different recipes for ice cream substitutes are out there. All the recipes have a similar doughlike texture that mimics ice cream’s appearance but won’t melt under the lights — just check out the ice cream substitute in the following figure. These substitutes give you all the time in the world to get your perfect ice cream shot. Provided you’re not shooting packaging for an ice cream product (for packaging, what you see must be what you get), trying a substitute is generally fine if you’re not having any luck with real ice cream (or if you just want to have some messy fun!). Strawberry ice cream substitute looks like real ice cream. Yes, really! Using a hand or stand mixer, mix the shortening with the mashed potato flakes. Add in the powdered sugar 1 cup at a time. After adding 3 cups, mix in the corn syrup and the berries. Continue adding the powdered sugar until the mixture starts to form a doughy texture. When you can touch the mixture and it isn’t sticky, you know you’ve mixed in enough powdered sugar. If the dough is a little too dry, mix in another tablespoon of mashed berries. Knead the dough for about a minute (right in the bowl is fine). When you have a smooth ball of the dough, you can start scooping away! Although you can easily create an ice cream substitute, when shooting a cup of glossy gelato or a frosty sorbet, you’re going to have to use the real thing. For those items, just keep to the dual mantras of fast and cold.